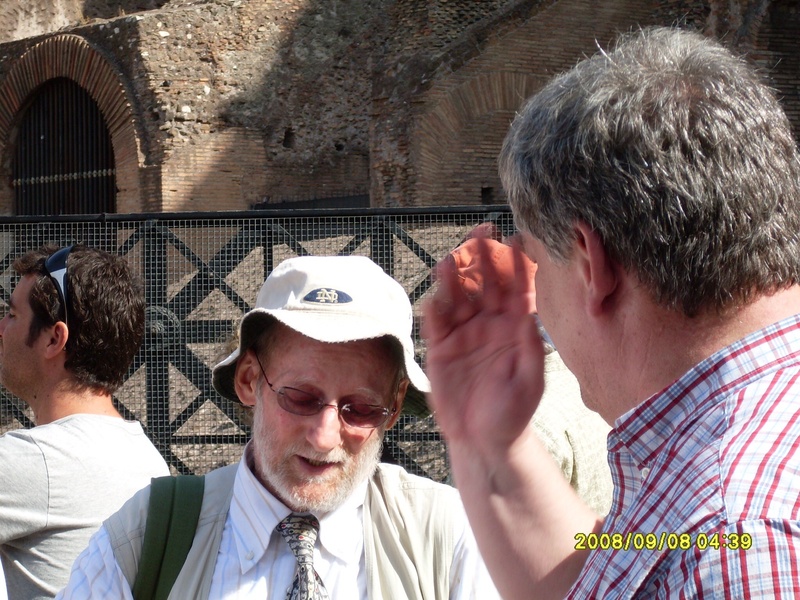 On our first trip to Italy in September 2008, we booked a tour of the great Colosseum through Angel Tours. After all, how could one visit Rome without seeing the Colosseum with your own eyes. It was a very hot day, not a cloud in the sky and the sun was there in full force. We met up with our wonderful little chatty tour guide across the street from one of the greatest structures of all time. Oddly enough there was a subway station, right across the street from the Colosseum. The tour started out with the first two hours going through the Colosseum and then for the second half, we were led through the forum. -The colosseum is home to hundreds of cats, mostly strays. They are collectively cared for and fed by a group of people dedicated to their welfare. While in the colosseum, I didn’t really see many cats as they live in the lower levels, and generally shy away from the tourists. 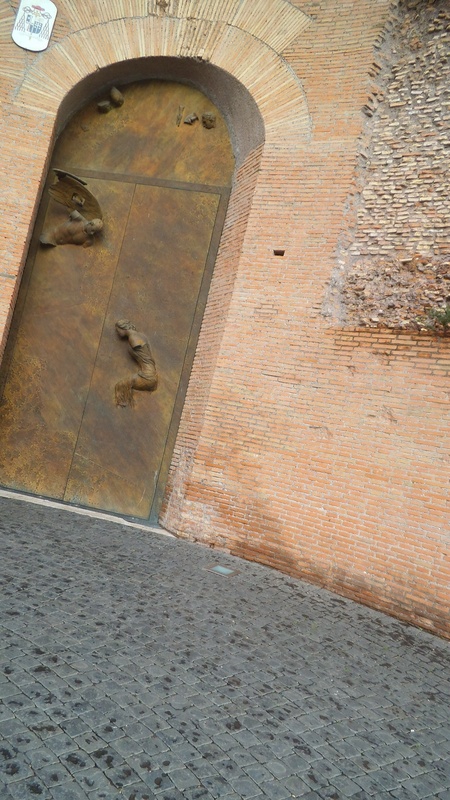 -Another thing that I learned was that the Colosseum is now considered Holy Ground on account that many Christians who were slaughtered during a public execution for not denouncing their faith. -A while back, a pope declared that those who had died in the Colosseum defending their faith were now martyrs, thus deeming the Colosseum as Holy Ground. -Another interesting fact is that original materials from the Colosseum were used for start up materials in helping to build St. Paul’s Cathedral. 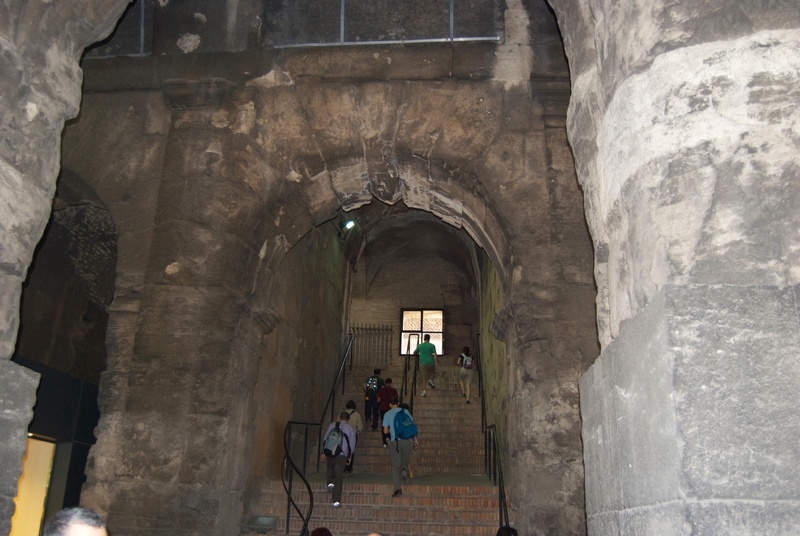 -The Colosseum has a working modern day glass elevator. It holds about ten. -The Colosseum was designed for easy crowd dispersal. The entire audience of 45,000 to 55,000 could exit the building in five minutes. -In ancient times brothels would advertise they were open for business by etching phalluses into the Colosseum walls. The larger the phallus, the bigger the brothel. -The Colosseum was built over the site where Emperor Nero had built his lavish swimming pool. -Once a year, the Pope visits the Colosseum and holds mass there. 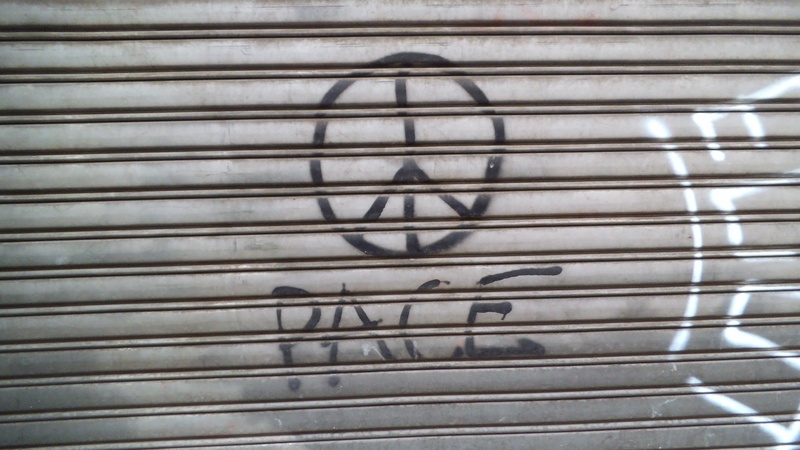 The dynamics of this place can be quite overwhelming. 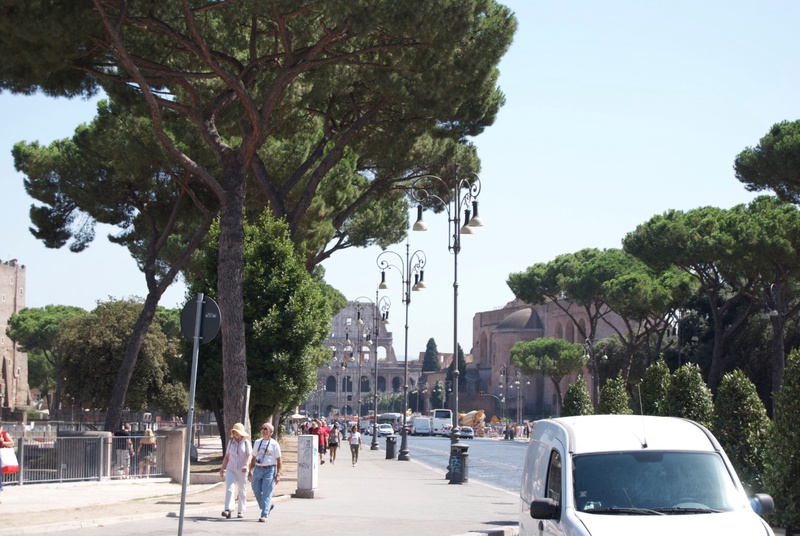 Outside the walls of the Colosseum are incredibly busy streets filled with Vespas, luxury cars, city buses, and every minute or so, you can hear a nearby ambulance siren careening off into the distance. Believe it or not, I did not see one shop or vender within the walls of this incredible ancient building. I suppose they left that business to the incessant pedlars stationed outside the gates who are visible day and night, nonstop. 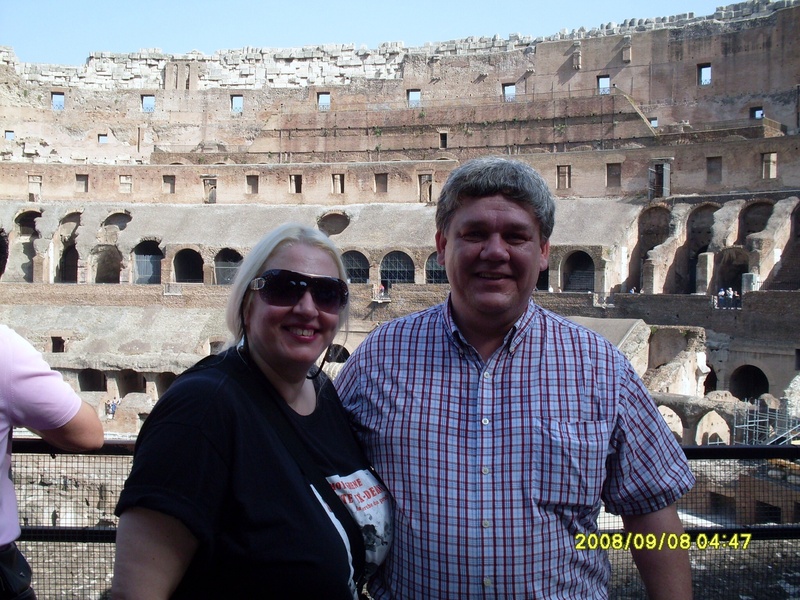 On our second visit to Rome, we decided to pay the Colosseum one more visit. It was quite a different experience from the first time. I’ll leave that story for another day. Inside the Colosseum Gates. This is where you will find the brothel etchings. Look closely and you may find one. The stairs are slanted slightly forward to help speed up crowd dispersal. Our wonderful chatty little tour guide. 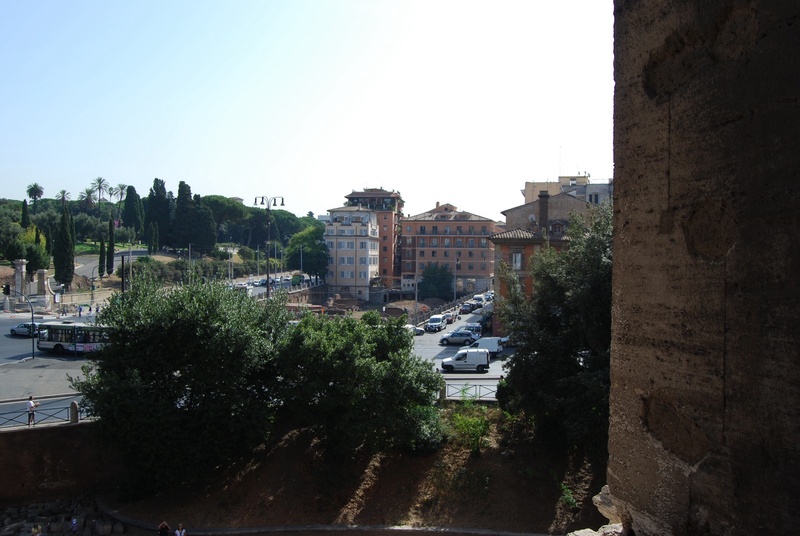 The view from a Colosseum window. The grounds by the buildings in the centre of the photo were being excavated as they found that was the sight of the gladiator school. Also, deeper within the grounds shown in this photo is the Domus Aurea, or the remains of Nero’s palace. I’ve put that on my bucket list. They say the painted frescos still retain their colour and are absolutely breathtaking. 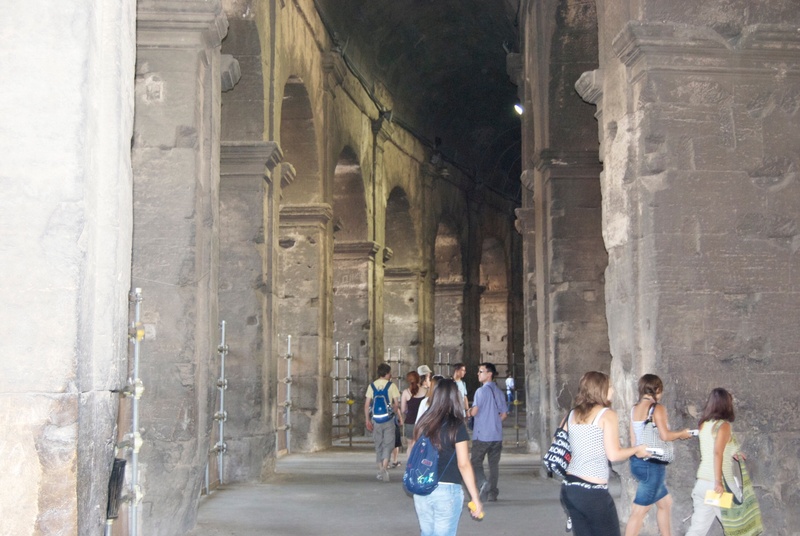 The Domus Aurea is rarely opened to the public as it is an archeological dig in process. There are many safety concerns with flooding and water damage.